The new Mazda6 Saloon is easily one of the best family saloon cars on the road right now. It looks classy, offers plenty of driver enjoyment and its running costs are family-friendly. There aren’t all that many non-premium, large family saloons around anymore. The Honda Accord has been discontinued, while Renault hasn’t been in this market for a number of years. But despite the rising popularity of the SUV, consumers are still interested in what a slick-looking and accommodating car such as the Mazda 6 has to offer. OSV takes a closer look at what it’s all about with our Mazda6 saloon review. Large family saloons aren’t usually much fun to drive, but Mazda has a reputation for developing cars that can offer plenty of entertainment. That’s exactly what we have here. Mazda’s engineers have clearly worked around the clock to make sure that this hefty machine can handle almost as well as the much smaller Mazda MX-5 Roadster. They’ve pulled it off, too, thanks to pedals, gearbox and steering that are just as well-weighted as this cars stablemate. The ride is a bit firm, however, and there is no doubt that it’s more at home on smoother roads. Handling is exceptional, the saloon is remarkably agile and you get lots of grip. If you don’t need an exceptional handler, you could overlook the Sports model for something more comfortable. We especially like a new system that Mazda has christened G-Vectoring Control. This system uses your steering input to alter the engine’s output so that you can string a series of corners together with lots of fluidity. This is not so much intended to make the car racier, but instead to make it more stable. 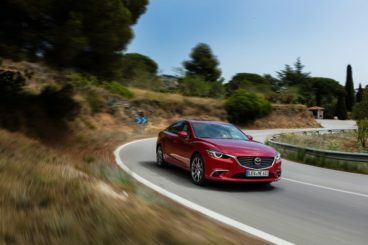 The diesel engines are better suited to the Mazda 6 Saloon than the petrol and begin and end with a 2.2-litre unit, that is available in either 148 or 173bhp guise. The former can do 0-62mph in 9.0 seconds, while the latter is able to do it in 7.9 seconds. Both guises come with an intelligent new balancing system that limits mechanical noise. This is highly welcome, as last time around the engine was overly gruff, especially when pushed hard. There is only a single petrol engine available – a 2.0-litre unit that doesn’t impress as much as the two diesels. Unlike their rivals, Mazda have chosen not to fix it with a turbocharger, which means you have to hold onto the gears for a bit longer. Moreover, it takes a bit longer to get up to speed and takes around 10.2 seconds to cover the 0-62mph dash. Interior design is something that Mazda are excelling at, at the moment and this one’s cabin’s matches its exterior in terms of style. It looks modern and plush, whilst we particularly enjoyed the chrome highlights. The dash is well-built and feels as though it’s robust enough to last a while. It’s coated with leather, which gives it an upmarket feel. A minor criticism is that the leather which covers the steering wheel wears easily and becomes shiny, while the gear lever switches would have benefited from smarter styling. A 7” colour screen comes as standard across the range and while it’s easy to use and good to look at, it is prone to fingerprint markings. These are not permanent, of course, but you might find yourself cleaning it more often than you’d like. Mazda have forsaken a bit of practicality in favour of sharper looks and there are roomier cars on the market. However, it’s acceptably practical. The cabin is roomy enough and there are an adequate amount of storage spaces, dotted in and around the place. Visibility is good thanks to large windows, but it’s not going to be all that easy to park – this is a huge car, after all. A sloping roofline might look good on the outside, but it compromises headroom and therefore comfort in the rear. Taller adults will struggle. The boot measures 483-litres and comes with a narrower opening to last time around. It’s therefore not only smaller than the old Mazda 6, but also a number of rivals in this class. 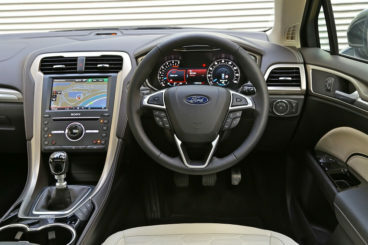 Standard on all models are Bluetooth connectivity, a USB connection, cruise control and a multi-function steering wheel. Opt for the more expensive models and you’ll also get power-folding exterior mirrors, a heated steering wheel, and electric memory seats. New updates include a head-up display, better graphics for the colour dial display and an improved BOSE system. Prices for the new car start out from £19,800 and rise to almost £28,000. If you prefer to lease it, you can pick up a deal from as little as £230+VAT per month. For more information on our lease and Mazda 6 finance deals, you can check out our page here. This is a pretty big car which manages to keep running costs respectable. This is in part due to clever i-Stop tech, which stops the engine whenever you aren’t moving, such as when you’re stuck in traffic. More expensive models, meanwhile, also benefit from i-ELOOP, a system that captures energy from the brakes and uses it to power some of the electrics in and around the cabin. The cheapest model to run is the 2.2-litre 148bhp diesel engine, which, despite its considerable size, incurs an annual road tax bill of just £20. Opt for the more powerful diesel engine and emissions stand at 119g/km of CO2. It’s also capable of returning fuel economy of 62.8mpg. The petrol models will naturally be more expensive to run, but they won’t break the bank. A 2.0-litre 143bhp unit is good for 51.4mpg, while the 165bhp variant averages 47.9mpg. These are just official figures, though and what you achieve in the real world may be a bit more underwhelming. Mazda wanted their saloon to drive as well as their exciting MX-5 Roadster despite the differences in size. They’ve pulled off something special here, sporty and satisfying. Crisp, racy lines look smart and don’t diminish interior space too much. The design is assured and is very much tailor-made for confident families who know what they want out of life. For its price point, you’ll be hard pushed to find a better handler, a plusher interior and a smarter looking saloon. Not only does the limited engine range mean you don’t have much to choose from, it also means that it isn’t especially cheap to insure. The entry-level model sits in group 18, while the most expensive to insure occupies group 23. The bigger wheels are enticing, but they will make the ride overly firm. Let’s see how the car fares against its rivals in the comparison section of our Mazda 6 Saloon review. 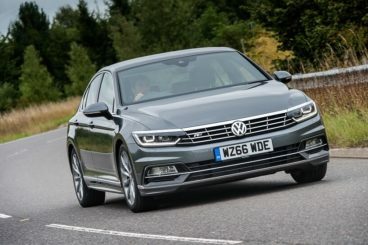 The new Volkswagen Passat Saloon is one of the most spacious cars around. It is also well built and can match the Mazda when it comes to drivability. The Passat has certainly not always been entertaining to drive, but Volkswagen has really upped their game this time around. Despite weighing less, it has more strength and this combined with changes to the underpinnings are responsible for making it better to drive. Even if you approach bends with gusto, there will be little body lean. Our pick of the engines is a 2.0-litre 148bhp diesel, which is both smooth and refined. There is a costlier 187bhp that offers more power, but it doesn’t seem worth the extra cash. There is also a 1.6-litre diesel unit that has plenty of punch, but it’s let down by a lack of refinement. The range-topping twin-turbo 4MOTION 237bhp diesel, meanwhile, is paired up with a DSG automatic transmission and isn’t short of pace. Grip is assured by four-wheel drive and it can get you from a rest to 62mph in 6.1 seconds. There are no petrol engines in the range, but there is a petrol-electric hybrid model that combines a 114bhp electric motor with a 154bhp petrol engine for some impressive performance. It’s also the cheapest engine to run and can achieve fuel economy returns of 166mpg whilst being free to tax. None of the engines are expensive to run, though and can all average returns above the 60mpg mark. The 1.6-litre BlueMotion diesel has especially impressive numbers and is good for 76mpg. It’s also free from road tax. The interior is classy, with an upmarket look and feel. The exterior is much the same and sports a much more aggressive look than we’re used to from the Passat. The cabin is comfortable and quiet, the plastics used throughout are the best in this class. The Mazda just cannot compete with the premium feel of the 2016 Volkswagen Passat. The simple but stylish design of the dash is great to look at, while lashings of chrome contribute to a very inviting interior. The Passat is also super practical, helped in part by a longer wheelbase. Head and legroom is good upfront and in the back, while storage spaces include a good glovebox and large door pockets. The boot is 21-litres bigger than last time and now has a total capacity of 586-litres. You can increase this space by folding down the rear seats. 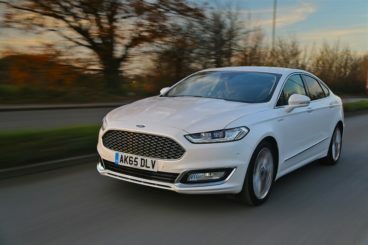 The new Ford Mondeo Saloon isn’t as much fun to drive as it used to be, but this is now an even more austere car that is comfortable and refined. The Ford Mondeo Saloon has always been the most entertaining car to drive in this sector, but the U.S. brand has decided that it’s time their family car grew up a bit. What you have now is a saloon that puts the emphasis on being quiet and comfortable, as opposed to engaging. The 178bhp 2.0-litre diesel engine is a bit of a disappointment. It’s quiet enough, but despite being able to do 0-62mph in 8.3 seconds, it never feels especially quick. It’s also a tad inflexible around the town and will stall if you change gear without much power. On the other hand, a 2.0-litre 207bhp bi-turbo diesel engine is much more impressive. It feels effortless and smooth and can get you from a standstill to 62mph in 7.9 seconds. You can snap up a hybrid model too. However, it hasn’t got a lot going for it and feels outdated. Unfortunately, it’s also noisy. This is a seriously heavy car, but running costs are not half bad. A 1.0-litre EcoBoost petrol engine is good for fuel economy returns of 55.4mpg and will only cost £30 a year in road tax. However, those mpg numbers will likely be hard to achieve regularly in real-world conditions. The diesels are a much better bet if running costs are a big priority of yours, with the 1.5-litre diesel engine able to achieve average returns of 78.5mpg while costing nothing in road tax. Ford have been keen improve the interior of their flagship saloon and they’ve done a good job. The dowdy cabin of old as been replaced by one that is more modern, more luxurious and which benefits from a lot more quality. We like the laser-cut quilted leather seats, as well as an instrument panel forged from soft-touch plastics. The classy revisions have been matched on the outside and the 2016 Ford Mondeo looks slicker and more commanding than ever. The car scores very highly on practicality. It’s bigger outside than its predecessor, which has resulted in more interior room and boot space. If you want to give the car the executive feel it can have, you would to add the optional panoramic sunroof – something we really recommend. Visibility is compromised by a rear screen, while the boot measures 550-litres. You can fold the rear seats to increase this 1,466-litres. The Mazda6 saloon has been a family favourite for a while now and in its newest form doesn’t disappoint. For a family car, it’s a lot of fun to drive and while the engine range is limited, the choices are impressive. It’s also roomy, while boot size is generous. The Mazda6 Saloon is as close as you’ll get to premium without forking out a premium price.